The father of murdered two-year-old James Bulger has made his first visit to the place where his son died. Ralph Bulger went to the isolated train track in Walton, Merseyside, as part of a documentary to mark the 10th anniversary of his son's killing. In the programme he talks about his guilt at being unable to save his son and his hate towards the schoolboys who murdered him. 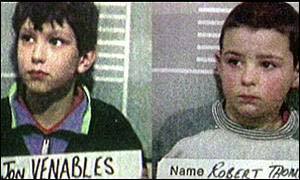 James was battered to death by schoolboys Robert Thompson and Jon Venables after abducting him from the Strand shopping centre in Bootle, Merseyside, on 12 February 1993. His body was found two days later and the pair were jailed at Preston Crown Court in 1993. But they were controversially released in 2001 and are now living under new identities. Mr Bulger told the ITV documentary: "I remember being in the courthouse and seeing them for the first time and being honest with you, all I could feel was hate, pure hate, like you've never felt before. "I wanted them to get life whether they are kids or not... It totally freaked me out. I had to sit there, day by day, while the two little bastards were laughing about killing my son, about mutilating him. "They definitely knew what they were doing." He also described the ruling which allowed Venables and Thompson's release as "like a knife in the back". He added: "They had... rights all the way through it. Where was James's rights? "They've took a life. They should pay for that and they haven't. They've been rewarded for it. They've had the best of everything. "I'm not an educated man but I've still got feelings, still hurt, still bleed. I still love... I just can't understand why it's happened." Mr Bulger, who now has three daughters with a new partner, added: "[James] must have been crying for me... he must have wanted me to be there to help him, to save him. The programme, which is screened on February 11 on ITV, also features American human rights lawyer Thomas Loflin who fought for the release of James Bulger's killers. He said: "Children are not born evil. It is very clear to anyone who is not ignorant that a 10-year-old child has, as science has established, only about 40% of the brain development of an adult."